The engineering team behind Android O at Google held an AMA on reddit today, tackling tons of questions that poured in from the Android community. As they requested, many of the questions revolved around developer stuff, such as API problems and other topics we don’t discuss heavily here on DL. However, there were a few interesting tidbits we wanted to share with you all. Below, we’ll place the question, followed by the team’s answer(s). If you want to see the full AMA, a link to the subreddit can be found below. How do you manage to improve battery life with every new release of Android? A large group of people who are experts on many aspects of the OS started by looking at all the data we had, and then brainstormed a huge list of opportunities and then started systematically analyzing to see what we could do. All of these features were the result: Play Console Dashboards for Android Vitals, background execution limits, background location limits, Android Studio performance profilers for CPU, memory and network, and more. We still feel like the battery life can get better so we’ll keep working on it. What is being done to shore up the Bluetooth audio solution? (Editor’s Note: This is a shortened version of the answer.) The Android Bluetooth, audio, and performance teams actually did a lot of work to improve BT audio in O. We flipped the switch internally since the most recent developer preview because we needed a little more time to make sure that things were stable, so you haven’t seen the fruits of that labor quite yet. Our testing shows that BT audio reliability is drastically better vs N because of these changes. We’re happy with how it’s turned out, and we hope you see the same kind of improvements. Is there a programming obstacle to full theming (a la TouchWiz or MiUI) or is it something the Android team doesn’t think is right yet? TL;DR Theming is not hard. Reliable and consistent theming is hard. There are technical and logistical issues with theming. The technical side is largely solved in O with RRO support (thanks Sony! ); however, we still don’t have stable APIs for describing what can be themed or adequate ways to verify that existing applications properly support theming. Why couldn’t you implement Night Light in Nexus 6P? Night Light requires a different implementation of the HAL used by the window compositor. With focus on newer devices, Nexus 6P did not receive an implementation of the new HAL interface. Will Android O do anything for Android Wear? With Android Wear 2.0 taking forever to roll out, and once it did, being plagued with issues of slowness, flat-out non-responsiveness, and UI/UX issues that really affect users, it seems like Google was trying to kill AW with that release. On Android Wear 2.0, we have made some technical changes so that updates to system components will not always need an OS update. For example, the watch face picker and notification streams have now been decoupled from the OS and can be updated more frequently and independently. We welcome feedback on any issues you might have. Can we expect a laptop mode for Android with windows, similar to what Samsung launched with S8, in AOSP in a near future? We don’t have any plans to announce at this point. Window management improvements is an areas we are still very interested in and will continue to work on in the future. The focus for here in O was the new PIP feature. With Project Treble in Android O means better and easier system update for OEM. My question is how long can we expect the Google Pixel and the future Google smart phone be supported in the future? 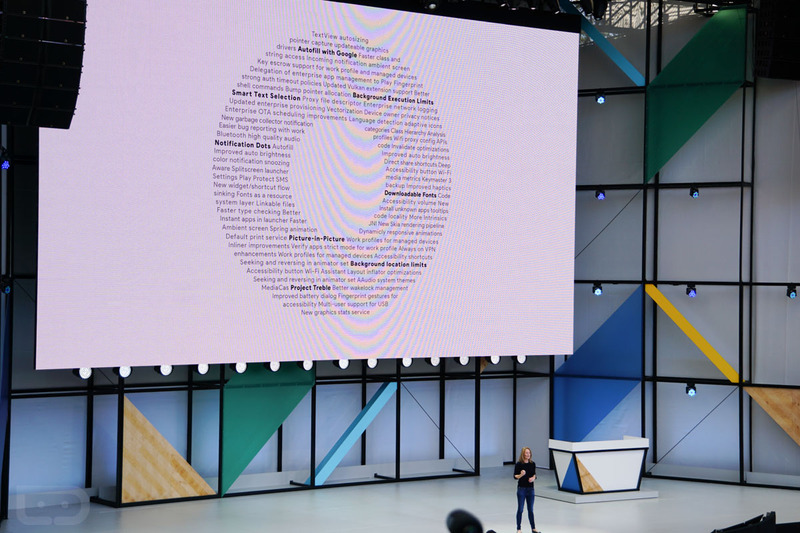 Devices launching with Android O will come Treble-enabled out of the box. How far along are you from completion on the return of Tablet UI? Is the white notification shade a glitch? What happened to the theming engine? For Android O the overall goal was to align the lighter notification surface with quick settings. As a consequence we did switch the default theme of quick settings and made it more consistent. The theming engine is still in Android O and it is up to the device manufacturer to provide different themes. And there you have it, a few of the good responses in the AMA. If you want to see full and complete answers, plus the entire AMA, follow the link below!